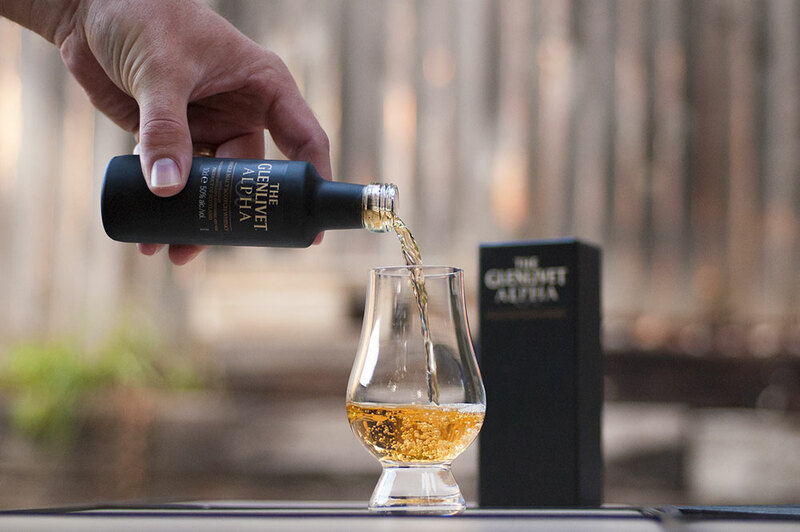 The Glenlivet Alpha α project began four months ago as a challenge to whisky geeks — for the first time Glenlivet was releasing a whisky without any tasting notes or cask information. Could Glenlivet Guardians (The Glenlivet's enthusiast society), and chosen whisky bloggers, uncover the secrets of the Alpha before Glenlivet's Master Distiller Alan Winchester revealed the answers? I heard about this release back in May from WhiskyCast, and even though I'm a Glenlivet Guardian member, living in Texas presents a series of hurdles when it comes to requesting or shipping whisky; therefore, I had resigned myself to living vicariously through the tasting notes of my overseas mates. So, imagine my surprise when two weeks ago I received an email from a PR representative of Glenlivet asking if I wanted to participate. What secrets does the Glenlivet Alpha α contain? Let's find out!. View a high-resolution version, or view this image on my Instagram feed. The color of the Alpha α is golden yellow, not quite amber in tone, but a vibrant, youthful color palate. No over-the-top sherry cask or caramel coloring influence here. I decided to leave a dram in the freezer for a while to see if they chill-filtered this expression or, like their Nàdurra, it's 'original'. Based on my temperature and water tests it appears it is not chill-filtered — Bravo! Rosemary, nutmeg, and cloves, sprinkled with cayenne pepper and wrapped in vanilla and honey tones fade to reveal toasted bananas and grapefruit — almost bordering on tropical fruits. The nose hints of Glenlivet expressions I love, like their Nàdurra, but contains notes I don't normally associate with the Speyside malt. Lovely. A bit of a surprise, based on the nose I was expecting the whisky to roll gently over the front of the palate but it skipped straight to the back! Soft with a light mouthfeel, toasted fruits come across first — more orchard fruit than acidic citrus. The fruits were just the opening, as the whisky begins a strafing run back across the tongue, an assault of chili pepper mixed with ginger, cloves and a hint of nutmeg. Settling down from the spicy run across the palate, the Alpha α has a medium, drying finish, revealing toasted wood notes and more pepper. Even though this is bottled at a highly respectable 50% ABV it's extremely easy to drink. Quite delicious. Three nights ago I was attending a whisky tasting event in Dallas, TX and was asked what I thought would be the next big innovation in the whisky industry. My reply was that there wouldn't be a new innovation, at least not involving a new product release, but rather an industry wide innovation in marketing and a new attitude towards NAS releases. I based this belief on the ever growing global demand for whisky and the fact that many distilleries are ill-equipped at this time to meet the demand due to their current stock supplies. Scottish distillers are especially hindered by this, as their marketing model of releasing age statement expressions prevent them from reacting quickly to such changes in the market, and decades-old advertising techniques that have shunned NAS releases in the minds of consumers will need to be overcome to allow distilleries to compete in this new market. To that end, even though the Alpha α project has kept the age statement of the whisky a secret, I believe this PR push has been to seed the market to promote a new NAS offering from The Glenlivet as part of an industry-wide move to satisfy the growing world demand with new expressions. Based on the press and buzz on social networks, I think the project has been a big success, and if I'm right this will just be the first of many NAS releases we can expect from Scottish distillers over the coming years — Alpha indeed. The good news? Alpha α is a fantastic whisky, and age statement or not, the adjustments made in the maturation by Alan Winchester and his team at The Glenlivet have produced a unique expression that have me wanting more. I originally wanted to post this review earlier in the week (June 3rd), but my wife came down with a nasty illness that forced me into service as Mr. Mom. So, I wasn't able to complete this review before Alan Winchester made his big reveal June 6 on YouTube (see below). While Alan doesn't reveal the age of the Alpha α, he does let us know that the big surprise is the casks used to mature the whisky — first-filled, Scotch conditioned casks. It's not clear from the initial reveal if The Glenlivet is using American white oak (Quercus alba) or European oak (Quercus robur) — there are certainly notes present in this whisky which one can make a case for either — but the fact that they conditioned each cask using scotch whisky instead of the more traditional ex-bourbon casks tells me these are probably re-used American white oak Nàdurra casks. Cheers! A big thank you is owed to my friend and fellow Whisky Blogger, Steve Prentice, of the Somerset Whisky Blog (@steveprentice), who suggested the PR team from The Glenlivet contact me as a US blogger for their Alpha α project. Read Steve's review of The Glenlivet Alpha α, as well as The Glenlivet 12, 15 and 18 year old expressions. I agree, at that price Alpha competes with The Glenlivet 21 year old as well as several other fine expressions, such as the Macallan 18, Balvenie 21 Port Wood, Bruichladdich Cuvee 407 PX, Glenfiddich 21, and Highland Park 21 — just to name a few. However, we have seen several limited NAS offerings in the past few years priced similarly that do very well, but tend to be niche expressions within the industry (the Bruichladdich Octomore releases come to mind). I'm not sure if Alan Winchester is planning a wide release of Alpha α in the near future, my hope is that he will, and just like Ardbeg's public release of their popular Committee bottling of Alligator a few years back, the cost of a wide release of Alpha α will be under the $100.00 USD mark.